Getting caught in a moment, situation or circumstances annoys me. I like to have options and opportunity for change. The last several months I have been caught in recovery from the tornadoes. The insurance company dictated how much would be spent on the recovery. The contractor dictated how fast the progress would occur. I just sat around doing the “woe is me” two-step waiting for results. This last week my family has been actively involved in getting the house completed. We are doing the painting and clean up. Every morning we spend some time working and sweating on the home. It feels like in this one week more has been accomplished than in the past three months. I recognized something as I sat down to write this particular post. I stopped complaining about my situation and started doing something. God told me from the beginning that HE would rebuild the house and that the whole situation was in His hands. I still had to file the claim, talk to the adjusters, work with the contractors – I had my own actions that needed to be completed. There is always an action involved in the blessing. What does all of this have to do with Galatians? It is even simpler than I would have ever imagined. All I need to do is do what I know to do and that doing will keep the chains from returning. It is the INACTION of my life that allows the chains to return (and sometimes even encourages it to happen). 1. Let it go – remember that everything comes from God and is in God’s hands. Holding on to a grudge will pull the chains back on your shoulders. 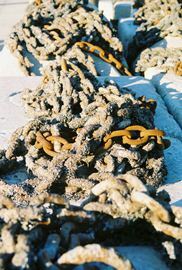 Heavy chains make it difficult to move and cause the action to cease. Drop the resentments and let God pick them up and take care of it all. 2. Have a plan – know what it is that you should be doing and then start doing it. Simple things (like taking the laundry out when it is done or taking the dogs for a walk) keep you moving in the right direction. These actions also make it a lot more difficult to find the time to do the things you are NOT supposed to be doing. 3. Know your priorities – God first, family and others second and then ME time. Putting the right focus on the actions and activities of life will free you up to become all that you are created to do and to be. 4. Pass on the excuse – no matter what the reason, explanation or “yes, but,” they are all just another excuse that has kept your from doing what you wanted to do and knew you should do. I will take one step closer to the freedom that was provided for me. Getting moving into the things I know to do will help me to avoid slowing down and picking up the chains that die me down, drag me down and hinder my blessings. Are you living free and do you have any tips or thoughts about how we can all stand fast in the liberty that has been won for our benefit and blessing? Share your thoughts and let us all begin to no longer live entangled in the hindrances of life.